Ever get ‘hooked’ by what other people think? Maybe you have a great idea for your business (or personal life…) but just can’t seem to implement it because you’re focused on the reaction or opinion of others? As a 27-year entrepreneur, it’s something I’ve struggled with as I’ve scaled each of my businesses. And, it’s a topic that comes up often with clients and people I speak with. I even wrote a blog about this a few years ago (read it here). The more connected we are because of social media, the greater our capacity for visibility & vulnerability, the more hooked (and overwhelmed) we can become by it all. Doing the work necessary to build a business means we need to step into a new, larger space we haven’t occupied before. We need to do things we haven’t done, be visible in a way that may not be comfortable for us, try something new…and possibly fail. Let’s be honest, it can be a tad scary. When we get hooked, we’re making an assumption about what someone may (possibly) be thinking, and then make choices in our business that impact our actions, our success, and self-confidence. More importantly, those thoughts that stop us become a habit. Yes, we may place too much weight in what others (might) think, but we also get hooked by our own repetitive thoughts and beliefs about it all. And, the 64K question is, what are the costs of this? We undermine ourselves and our business BIG time. Mindset matters without a doubt. It’s not that “success” is never getting hooked by others reactions, it’s about becoming less “hindered” or emotionally attached to them. What really matters to you in the end? Creating the life and business you dream of, or never screwing up or possibly embarrassing yourself? Our mindset directly influences our actions. Let’s face it, putting yourself out there, trying something new, stretching beyond your comfort zone is something many people simply aren’t willing to do. So just the simple fact you’re willing to, allows you to pass go and collect $200. Brava. Kudos. Mazel tov. Seriously. Take a moment and pat yourself on the back. If you’re not willing to believe in yourself, how can you expect others to? If we get tripped up before we even get out of the gate, we create (and experience) the failure we’re trying so hard to avoid. If we get tripped up before we even get out of the gate, we create (and experience) the failure we’re trying so hard to avoid. This is why mindset matters. Listen, we all have thoughts and feelings of self-doubt, fear, and a ‘healthy’ dose of self-criticism. It’s not the thoughts, but the beliefs in those thoughts, that ‘hook’ us by the ankles and stop us in our tracks. Ready to unhook, own your brilliance and share your gifts with the world? Where is it you get most hooked? What are you doing (speaking, submitting a high-end proposal, raising your rates)? Who are you with? Does a particular person trigger you? And, here’s the biggie: what’s the belief about yourself that are getting hooked? When you know what’s going to trip you up, you can devise a plan and be ready for it. …and the impact you want to make in this world. This will help you move out of second-guessing yourself and into forward moving action. When you know what’s most meaningful to you in the long-term, short-term decisions (and getting out of your own way) are easier. When have you put yourself out there and been successful? Be sure to journal about these times so you can have them in your back pocket to lean into when needed. We can always pull up memories of when we’ve made a mistake or embarrassed ourselves because we can viscerally feel it. Connect to your wins so you can feel those with all your emotions as well and empower yourself to move past your fears because you know you’ve succeeded in the past. Have unhooking tools of your own? 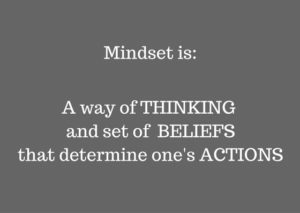 Do you believe mindset matters? I’d love to hear, please share in the comments below!